But I’m sure no one wants to read about my adventures with weeding and shoveling wood chip mulch on all of my flower beds, right? Right? (yes, you in the back; no – I can’t think of any discussion more boring than mulch at the moment) So, instead, we’re going to take about taking cuttings. A lot of things in the garden don’t look really spiffy at the moment and frankly, a lot of the excitement gets drained out of things when you are faced with a sink full of zucchinis. But making new little plants is always fun and means that next spring, you will have all sorts of things that you won’t have to go to the garden center to buy. We have a rose here that I inherited from my mother. It comes from a huge hold bush that was behind the garage at my parents house and I have very fond memories of it’s arching canes, covered with pink old fashioned blossoms. I also have a very un-fond memory of my father trying to teach me how to ride a bike and on that day, I not only fell off the bike into a neighbor’s hedge made of what we called ‘pricker bushes’, but when I tried to ride in the back yard, I also ended up keeling over into the rose bush and like most old-fashioned rose bushes, it has rather nasty thorns. But, I loved the flowers just the same – mostly for their fragrance, which was ‘knock you off your feet raspberry’ (I should trademark that). I realize that ‘real rose people’ are into form and rankings and so on, but I’m still that 5 year old at heart (and I think a lot of people fall in love with roses from their first experience with them which is…through the nose), and I’m determined to keep this rose around. When I got married and moved into our first home, my mom, went out and chopped off a chunk of the rose bush (my mother was not subtle – she literally went out with a hatchet and a shovel) and the DH and I dug a hole next to our rented house, threw in some compost and put the rose bush in. Five years later, when we bought our own home, we dug it up and brought it with us. Roses are tough. But you know, I’ve never seen a picture of a rose in a book or magazine which looked like this one. I’m sure it was just some rose that was in production when my parents house was built in 1917 and the first owner bought it from the local nursery and threw it into a hole in back of the garage and that was the end of it. It’s not a terrific rose – it’s one of those flat old-fashioned roses with a gillion little petals and is only 2-3″ across. But the fragrance is intoxicating. It’s not even in the best spot in our yard – it’s in what’s probably the worst exposure and I really should dig it up and move it. But, I’m concerned that if I do it, I might kill it this time – the bush I have is from a bush that was probably 50 years old when I got it. Scary thought. Potting mix or coarse sand (be careful with this – the bags of ‘coarse sand’ from the big box stores many times have chemicals in them which will kill cuttings). If you are going with potting mix, also get a small bag of Perlite ™ and mix it together in a ration of 1 part Perlite(tm) to 3 parts potting mix. Rooting hormone: There are all sorts of these around – powders, gels, liquids. If you are doing this with what is called ‘soft wood’ cuttings, then the regular stuff will do. If you wait until later in the fall, when the weather has gotten colder, the ends of the branches on the bush have matured (that is, the outside has turned brown and more ‘bark’ like), then you will want to get the type of hormone for ‘hard wood’ cuttings. Big pot or some sort of big vessel with holes in the bottom. Now, the trick with this is as follows: take a cutting – about 4-6″ off the end of a growing branch, stick it into some sort of moist growing medium and keep it warm and moist for 4-8 weeks. Some of the cuttings are going to root. A lot of them won’t. This is not fool proof, which is why you see so many cuttings in the dish pan at the top (I drilled a lot of drainage holes in the bottom of that pan). If 25% of these ‘take’ then I’ll be more than happy. First thing – mix up your planting mix and put it into the pot or dish pan or whatever you are using and water it well. If it’s really swimming, squeeze out the excess water. You will want at least 4-6″ of growing medium so that the cuttings can put down roots. Take your cuttings. In this photo, you see the cutting on the left and the pile of the rooting hormone on the right. Now, you will want to strip off the leaves from the bottom 3 inches or so because that is what will be under the soil line. At the same time, with roses, break off the thorns as well. 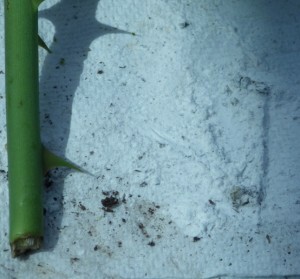 Once you do that, you’ll see that you have these little marks left from where you broke off the thorns – thorns are modified leaves, so you are actually giving the cutting a little bit of a scratch (which you would want to do in any case; with cuttings from bushes without thorns, you’ll want to take your fingernail and scrape down the sides of the cutting in a couple of places). This will give the rooting hormone spots to cling to, to encourage rooting. Roll the bottom end of the cutting in the rooting hormone until the bottom inch or so is covered in powder and tap off the cutting to get rid of the excess. Finally, and this is something I do since I have seen a lot of cuttings end up being taken off to ‘cutting heaven’ through fungus, is I cut the leaves at the top of the cutting in half. This does two things – first, it lessens the infrastructure that the cutting has to maintain and allows the cutting to put all of its energy into making roots. Second, it lessens the contact between cuttings – you’ll want to put at least an inch between cuttings – perhaps even more – and you really don’t want all of these cuttings touching one another. 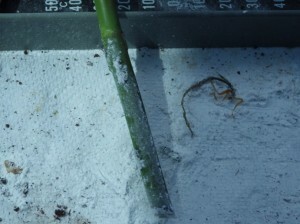 If one ends up with a fungus (which would not be a huge surprise), anything touching it will get that fungus as well and the cuttings will die. 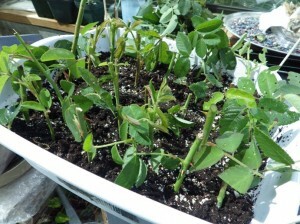 Then, put your cuttings into the growing medium and press the soil or sand around them. Give them a good drink to settle any soil around the cuttings and get rid of any air pockets. Then put the whole thing into a white garbage bag and seal it up. At this time of the year – late summer here in the northern hemisphere, put the whole thing in a shady spot and check back on it in a couple of weeks. If anything looks fuzzy, pull those out and get rid of them. Let the cuttings air out for a couple of hours, and put back into the bag. 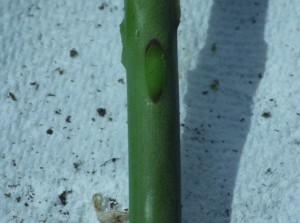 In a month or so, pull a little bit on one of the cuttings – if you feel resistance, then they are rooting. If not, put the pot back into the bag. If you are doing this heading into colder weather, you need to put the bag and the pot into someplace in your house where there is bright indirect light (that is, don’t put the bag and the pot next to a south-facing window) and it stays relatively warm. If it’s getting chilly, then put a heating pad with a towel on top underneath the bag to keep the roots warm so that they will root.